Cloud Security – A Misnomer? Srijith joined BT Innovate & Design as Senior Security Researcher in 2009 and is currently looking at architectural level security issues in cloud computing, Service Oriented Infrastructure (SOI) and federated identity and access management (FIAM) issues. He is part of the expert group advising European Network and Information Security Agency (ENISA) on cloud computing security assessment and is also a part of the group working on the Cloud Security Alliance (CSA) security guidance version 2 report. He is finishing his PhD. dissertation from Vrije Universiteit, Amsterdam where he was working under Prof. Andrew S. Tanenbuam and Associate Prof. Bruno Crispo on intra-system information flow control within the scope of data-centric policy enforcement. He also worked on other aspects of security, including applied cryptography, DRM, and system and network security. 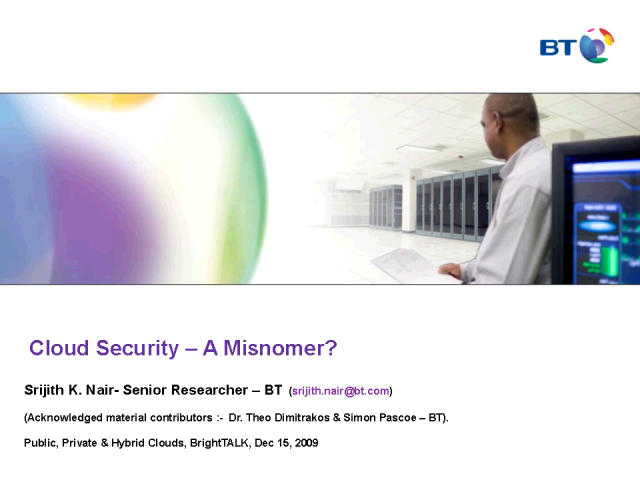 Title: Cloud Security – A Misnomer?